Art Babes are a collective of working professional artists and technicians who specialise in aerial performance, physical theatre, Burlesque and dance. Our artists have worked for Cirque Du Soleil, Erth, Legs on the Wall, Sydney Dance Company and are trained professionals in their field. Art Babes also offer Aerial Training, Burlesque Dance Training and teacher training. Spectacular aerial acrobatics performing gymnastic tricks and demonstrating incredible flexibility and strength in and around these aerial hoops! 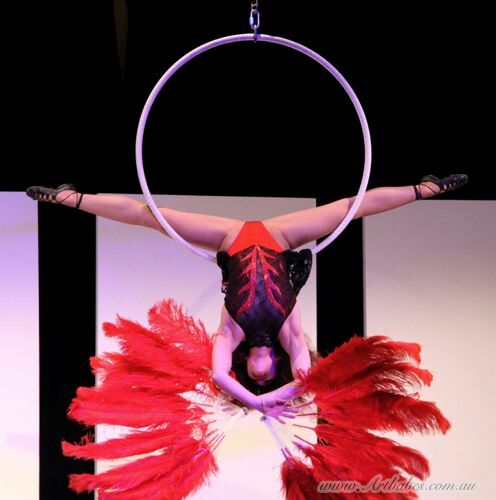 Our acrobats and aerial dancers have many years experience of entertaining audiences across the globe. You won’t be disappointed. Enjoy the thrill of seeing these aerial performers up close. It’ll be the highlight of your day, guaranteed!